BRIGHTON’S Weily Park Rockers finished their season in style last month winning the fourth grade grand final. The team took on the Hobart Lions in the SCA fourth grade grand final at Risdon Vale Oval. The jubilant Weily Park Rockers grand final winners proudly display the winning shield. 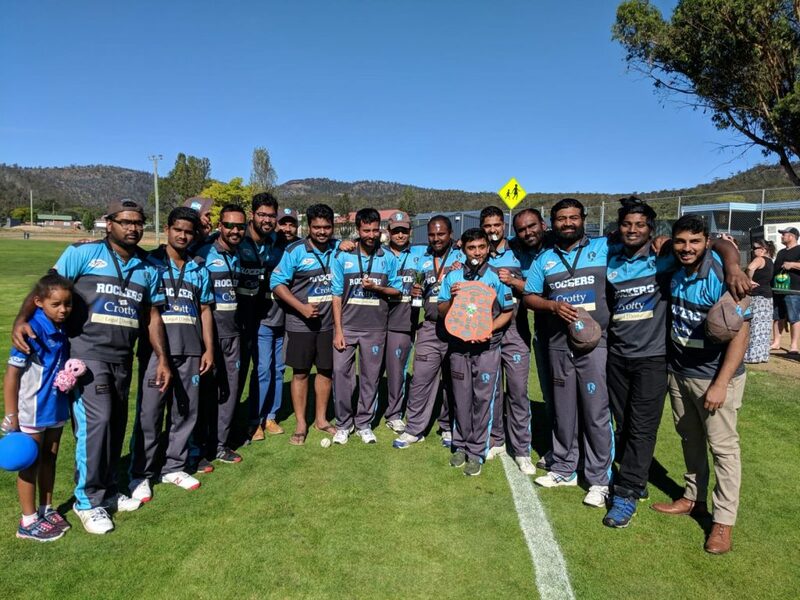 After a successful T20 tournament winning the premiership, the Weily Park Rockers finished top of the ladder in the fourth grade one-day series meeting the Hobart Lions (placed second on the ladder) in the semi-final. The Rockers just fell short and Hobart went straight through to the grand final. Fortunately, the Weily Park Rockers were given a second chance against the Montagu Bay Sharks to earn their spot in the grand final.The Weily Park Rockers won the toss and elected to bowl, sending Hobart into bat. Hobart was off to a good start with Jamie Latham and Nathan Price building a good opening partnership until Price was out lbw at the hands of Saianoop Yadama. Latham went on to make 31, Hobart’s highest score, before he was out caught and bowled by Anuj Shah. From there the wickets collapsed relatively quickly with some outstanding bowling from Shah, Prabu Selvaraj and Bhargav Patel seeing Hobart all out for 115 after 36 overs. The Weily Park Rockers had a shaky start coming in to bat, with the first wicket falling in the first over to Paul Buttge. The next wicket came only a few balls later with a run out and the Rockers were sitting at 2/4. After a small partnership between Kiran and Shah started to build, two more wickets fell in quick succession. Hobart was building momentum and could feel they were well and truly back in the game. With Yadama coming into bat at number 6 the Rockers were in trouble. Yadama has been known in the past for his ability to hit big shots and score runs quickly, however that day was the day he needed to play a different role with the Rockers sitting at 4/31. Shah and Yadama steadied the ship and started to tick away at the total until Shah was out caught bowled Jake Everard. With the score now 5/67 it was difficult to see where the game was going and Hobart knew if they could get the wicket of Yadama then they could win the match. Balaji Sivakumar came in to join Yadama and for a number of overs it was slow with only singles scored and both players having to stay steady and show patience. With only around 20 runs needed for victory, the tension was starting to ease a little for the Rockers and some boundaries were scored. With two runs needed, Yadama finished off in style with a four, finished with 55 not out. The Rockers were victorious against a formidable Hobart side and will join third grade next season. Damien Triffit 2/12. Best on Ground Weily Park Rockers: Saianoop Yadama 55runs (no) Anuj Shah 3/30, Prabu Selvaraj 2/21, Bhargav Patel 2/9. Well done to The Rockers.